- The elastic band is helpful to hold iPad closed securely while on the go. - Built-in Bluetooth keyboard with full-size keys and iOS shortcuts for fast, fluid typing.The Keyboard is held to the case magnetically and can be removed when not in use.It connects the bluetooth with easy-connect process. 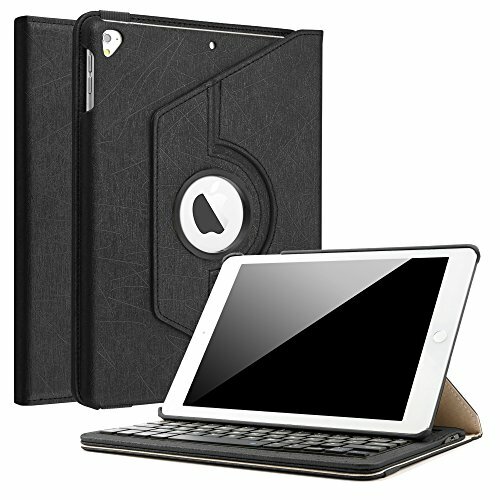 - 360 degrees rotating swivel allows the iPad to rotate both vertically and horizontally while in the case.So that the leather ipad case can provide multiple viewing positions for watching movie or typing. - Dual Layer hard interior cover and premium synthetic leather exterior perfectly protects the device against scratches.The product is endowed with fine texture and comfortable tactile impression. -Stylish ,Slim and Elegant Keyboard Case. Quality material and stitching. Precise cut and design, easy acess to all ports and controls. * Make sure the keyboard full charged(usually 4-5hours) before first using. * Turn on the keyboard. * NOTE: After you turned on the keyboard, the indicator LED will only light up for a while, then it will turn off, but the keyboard is still on. * Click "fn" + "C" to open the Bluetooth of the your iPad 9.7 2018 2017/ iPad Pro 9.7/ iPad Air. iPad 9.7 inch Keyboard Case - This case is designed for 2017 iPad 9.7 5th Gen(A1822/A1823), New iPad 9.7 2018 6th Generation(A1893/A1954), iPad Pro 9.7(A1673/A1674/A1675), iPad Air 2(A1566/A1567) and iPad Air 1(A1474/A1475/A1476).NOT compatible with any other iPad models.Please check back bottom of your iPad to find the model number. 360 degrees Rotating Stand Case - 360 degrees rotating swivel allows the iPad to rotate portrait or landscape.So that the ipad 9.7 inch keyboard case can provide multiple viewing positions to meet your different needs, such as surfing the web, watch movies or typing.When you use the iPad, it will be no slip or falling down. Detachable Wireless Bluetooth Keyboard Case - Built-in Bluetooth keyboard with full-size keys and iOS shortcuts for fast, fluid typing.With the keyboard being removable, it allows you to use the iPad like a mini laptop or just use the case as a stand. You can also use the keyboard separately to type on other bluetooth-enabled devices like your laptop, ipad, phone and tablet. Protective iPad Smart Case - Dual Layer hard interior cover and premium synthetic leather exterior provide full protection for your tablet.The Elastic strap holds your iPad closed securely while on the go. 100% Satisfaction Service - BoriYuan provides you with 24-hour email contact service & 1-year worry-free warranty & 30-day money-back guarantee. Any problem, please feel free to contact us. If you have any questions about this product by Boriyuan, contact us by completing and submitting the form below. If you are looking for a specif part number, please include it with your message.